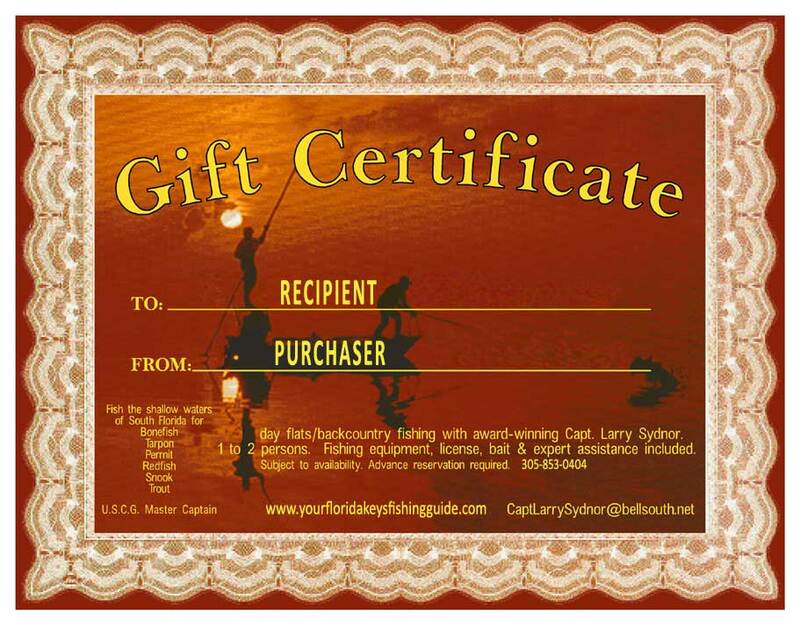 For those of you saltwater anglers that love Islamorada flats backcountry fishing and want to give the gift of a charter trip to a lucky someone, we offer a Gift Certificate for you to print and present on the special occasion. Most people know Islamorada is a great getaway. One of the most unique places on earth. Calm. Serene. Laid back. Just the right setting to recharge a person’s batteries and rejuvenate spirits. The PERFECT GIFT! In Islamorada, the Sport Fishing Capital of the World, the backcountry offers a grand slam shot at permit, tarpon, and bonefish not to mention fishing for redfish, snook and seatrout. Islamorada is such a popular sought-after trip destination with all of its’ wonderful hotels, restaurants and attractions that this unique gift is just icing on the cake and will be personalized and modified (full day/half day, date if selected, launch time/location) per your details provided for the charter with Islamorada flats backcountry fishing guide Capt. Larry Sydnor. Should it be a surprise gift, we will get contact information from you, the purchaser, so we can contact the recipient after presentation as purchaser advises or just before the trip as necessary. 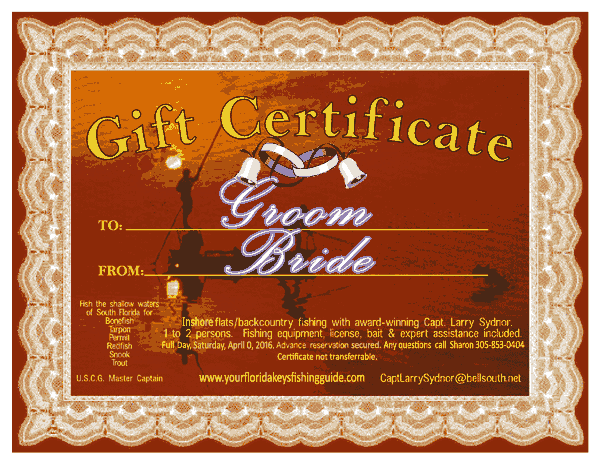 Specialty certificates can be designed with advance request.